The Framlingham Country Show and the Suffolk Food, Drink and Music Festival is set in the stunning surroundings of Framlingham College, very rarely seen by the public. The show promises a fabulous array of main ring attractions like the extraordinary Sheep Show, Falconry displays, Shire Horses, Sheep Racing, Dog and Duck Herding and much more. There will also be a fantastic dog area with dog rings with dog agility, flyball, dog shows run by Paws of Parham and Earl Soham Vets and we will have the unique Honiahaka Northern Inuit Dogs at the show. As well as all of this we have the Terrier and Lurcher racing which will be great fun. So bring your dog along for a doggy fun day out. Alongside these wonderful attractions will be some fabulous Rural Crafters and their demonstrations which will be a delight to watch from Thomas Jones, Woodlands Sticks, furniture making, blacksmiths, basket weaving and so much more. Why not come along and watch one of our many cookery demonstrations by local Chefs or listen to one of our eight bands playing daily. If it is something for the smaller people you are after come along and see Gemma’s petting zoo and hold one of her many animals or if it is the Reptile variety you prefer, Amazing Reptiles is the stand you are after where you will have the opportunity to hold a snake, bearded dragon or tortoise. Why not try one of our Circus workshops or have a laugh at Cosmo the Clown and his friends from the Foolhardy Circus. The event will also host some wonderful shopping to include everything from food to craft to lifestyle shopping. 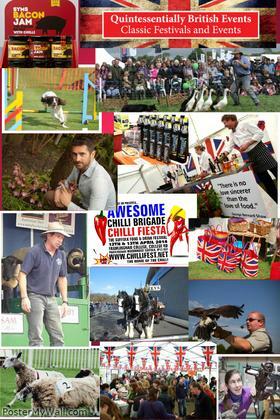 Come and try out all the Chilli products at our amazing Chilli Festival to held at the same time. Meet our food producers and find out where you food comes from, or meet one of our many Crafts people who make their own products, or simply spoil yourself with something from our Lifestyle marquee including Vintage Shopping. Support our “support our future” our Young Entrepreneurs Charity. Music will come courtesy of the County’s most up and coming talent, with young artists from the county’s schools set to perform. We will also have at the show our Young Entrepreneurs as well as our Art and Photography competitions, where you can enter now at www.classicfestivalscomp.co.uk. Why not visit our show website www.framcountryshow.co.uk and www.suffolkfoodfest.co.uk to book online discounted tickets and find out more about what is going on over the weekend. Taking place on the 12th and 13th April, we hope that everybody will come for great day out and embrace the outdoors. A lovely family day out with something for everybody. This entry was posted in Events, Food Fairs and tagged Food, Suffolk on 9 April, 2014 by beaniejt73. At Bressingham Steam and Gardens on Friday, South Norfolk Flavours 2014 showcased the wealth of local food-producing talent the area boasts and gave buyers from the hospitality, catering, retail and tourism industries the chance to meet suppliers in one place and find exciting new tastes to tantalise their own customers. 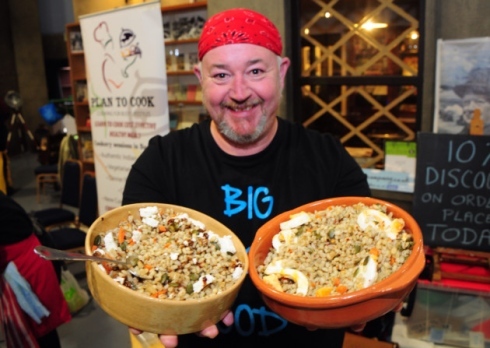 Martin Wilby, deputy leader of South Norfolk Council which supported the event, said: “The idea behind the project is all about making it easy for food and drink buyers keen to meet local producers and sample their goods. Being able to get together in one place will make it much easier for buyers who are looking to source locally in such a diverse market. At an event aimed to recognise the vital role that the local food industry plays in Norfolk’s economy and celebrate the bountiful produce that is made in one of the county’s largest regions it would have seemed churlish not to join in with an open mind (and mouth). South Norfolk Local Flavours Event at Bressingham. Mark Ford from Big Skies Food Co. Photographer Simon ‘Hollow Legs’ Finlay and I took a culinary tour of the exhibition hall at Bressingham, starting with a business based in Bressingham itself, Hodmedod, which sources British beans and peas and is the only company in the country which produces British baked beans in addition to dried pulises, dhal and a range of canned bean and pea products. Founded in 2012 by Nick Saltmarsh, Josiah Meldrum and William Hudson, the company sells British-grown beans – split and whole fava beans – and peas – Kabuki marrowfat, black badger, yellow, large blue, split green and split yellow. “For years, the British have grown beans and exported them – we thought that was a waste, so we use our British beans and peas and make wonderful products from them,” said Mr Hudson, offering Simon and I some roasted fava beans (like healthier peanuts – ridiculously moreish). Find out more about Hodmedod at www.hodmedods.co.uk. via That’s tasty! Showcase for fine South Norfolk flavours – Eating Out or Eating In – Eastern Daily Press. This entry was posted in Food & Drink, Food Fairs and tagged Food, Norfolk on 8 April, 2014 by beaniejt73.